Subject: What is the best(most elegant and easy) line of sight rules you've seen in a game? I want to create a game with line of sight in it. Turns out it's tricky to get it to work with simple rules without having a ruler etc. I'd like to have the posibility of units being in cover or completely hidden from certain angles, and I'd like to use some kind of grid or hexes for movement. Surely someone somewhere must have come up with a great way of solving this, without requiring players "making the call with their eyeball" or complex rules. Can someone tell me of any games that do it well? LOS is from hex center to hex center. Blocking terrain completely fills a hex, so you don't need to debate about whether the LOS is touching a tree or building or whatever. LOS exactly along a hexside of a blocking hex is blocked. You might want to look at Tannhäuser. Sam at The Dice Tower brings the LOS system in that game up regularly. Haven't played it or seen it myself but movement and LOS is handled by circles on the game board where color coding on the circles denotes what other circles are in LOS. With this system, LOS seems to be in the designer's control and without ambiguity. Pick any one corner of your space. Pick any two distinct corners of the target's space. If you can trace distinct (no overlap) uninterrupted straight lines from your selected corner to each of the two of the target's, you have LOS. Never had a disagreement about LOS in the course of the game's campaign. Plus, this system allows you to "peek around corners" (i.e. a situation where only one of two figures sees the other) and with some tweaking (just a quick idea - IA doesn't have this) provide oriented cover by marking square corners. If you can only trace LOS to marked corners, target is in partial cover, etc. That is similar to how the LOS between squares in the older Star Wars Miniatures game. Not sure if they otherwise have much in common other than the theme and scale of the miniatures. If you can trace a line from one corner of your square to ANY part at all of the target square there is LOS. But there is a drm for target in cover if you can not find a corner that allows you to trace a clear line to ALL parts of the target square. For corners that means you can stay behind a corner and get a good unmodified shot at someone, but they get a negative cover drm when firing back because no matter what corner of their square they trace LOS from they will not be able to trace to all of the square behind the corner. The reality, though, is that figures that are in combat are *moving*. That means they're not standing up like a pop-up target, nor are they always in the center of that space. Without a board, a quick way is to use the side of a card and touch base to base. If only one side of the base touches, the figure has partial LOS. Done! But the big circles create another problem: Is it possible to see from the bottom left square to the square just right of the miniature (so I'm trying to see to the square which is 3 to the right and 2 up)? I liked the rules of Adrenaline. You see everything inside the same room. Additionally, if you are standing right next to a door you see the complete other room. This also creates nice situations where you can see someone that cannot see you. The command and colors games like Battle Cry: 150th Civil War Anniversary Edition and Memoir '44 do a good job at simply implementing line of sight. Just treat the whole hex as the same terrain as others have said. I agree that making whole hexes same terrain and have sight go from center hex to center hex sounds neat. It could create need for a ruler or eyeballing on long distances though, see this example. It's not super clear who can see who. Black hexes block LOS. Red blue and green are shooters. Of course you could pull out the measuring tape, but that's exactly what I want to avoid having to do. You very often don't need to use a ruler at all. Familiarity with hexgrid geometry works here. E.g. from blue (northwest) to yellow (east) the LOS is clearly blocked because the LOS moves southeast from the blue hex, and therefore hits the black hex directly southeast of blue. I.e. a line directly east of the blue hex will miss the yellow hex; you need to turn the line a bit clockwise, and it obviously hits blue's black neighbor then. From blue to red (south) the LOS is clearly OK. If you moved from blue along the hexspine of its black neighbor, your line would be too far east from red; the real LOS to red is a bit more clockwise, so does not touch that black hex. Similarly from red to blue, that black neighbor of red's is clearly not blocking the line from red to blue; the true LOS is a bit clockwise from red's black neighbor. The (clear) LOS between red and yellow is admittedly less obvious, but (in principle) deducible (with practice and familiarity; e.g. I usually count from each end towards the center to find the center point of the LOS, which is usually a hex center or center of a hexside or a vertex, and continue interpolating like that) without needing a ruler. That is unlike how LOS which depends on specific pictures in hexes really does need a ruler, because you can't use pure geometric reasoning to tell. If you are concerned with line of sight in a wargame, you could look at the detailed analysis made by Simmons. The solution presented involves designing the line of sight into the 2-dimensional board, by inference from the 3-dimensional terrain. Sounds complicated but it is elegantly simple for the player, but requires a lot of understanding by the designer. +1 for Tannhäuser. The color-coded line of sight is the best I've seen personally. I also like Mansions of Madness 1E's dot-to-dot system. Good rule of thumb, simplicity above all else. I'll gladly sacrifice theme, realism or even making any kind of sense for simplicity when it comes to LOS. If it takes more than two or three seconds to figure it out, or if I have to use a separate component to do so, it's too complex. Yet another +1 for Tannhauser. I came in specifically to mention it if someone else hadn't. There is never any question. Brilliantly done. 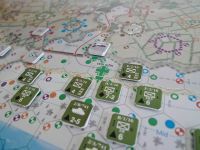 D-Day at Omaha Beach (and the other games in that series) uses colored dots for LOS. But it is cheating a bit because units on one side are limited to only ever be in a limited number of all possible hexes, so general LOS from all to all other hexes is not needed. I highly recommend to go with an easy method like this. We used this one in the past and it really accelerates the game. b) big units can be hitten. Also here to +1 Tannhauser. It was the most "no question asked" LOS rule I've encountered. A LOS may run into or out of different blocking terrain, but not through any. Of course, this system doesn't take into account terrain contours very well, but if the scale is right or the battlefield is flat it works fine. True; I unconsciously considered that to be an "obvious" convention, but you're totally right that it should be explicitly stated. The hex one isnt obvious to me. Consider a bridge in hex. Is there visibility between the two spaces in the bridge if one of the two spaces between them has an obstacle? "LOS exactly along a hexside of a blocking hex is blocked." I'm impressed, you're very good at reading hex maps Matches my measurements. I agree that it's a pretty solid if not perfect LOS method. I got curious and played around with the same scenario in 3d to see how it feels. Miniatures with small bases placed off center in the hexes on a flat map. Not that clear. Tall 3d terrain, colored bases and bases filling the entire hex makes it much more intuitive to read. The rules match what the eyes see very well, your eyeballing matches the actual rules. But it would hurt the realism/artistic vision to have to make all terrain hex shaped like that You could probably get away with just having fairly thick bases on the terrain instead. The simplest I've seen was in the oft-forgotten WoW Miniatures game. It used a hex grid and made the simple assertion that the players "count the number of shortest paths" and then determine whether more of these paths were blocked or unblocked. A single path was blocked if any sort of blocking terrain was included in it. The upside of course is that it's very straightforward and results in quick, inarguable determinations. The one downside I've seen when using it in my own design is that its usefulness becomes much more clumsy over longer distances. This never mattered in WoW as ranges were all very short. This can, however, be countered by experience and learning shortcuts to counting out each hex. And as one user pointed out (sorry, I can't see the other posts to review from this format) experience with hex geography will cut down on time spent for most measurements and in terribly close situations counting it all out at least yields a clear result without worrying about shaky-handed lasers or strings affecting the board. As many times as it's been referenced, I think I must check out this Tannhauser game.